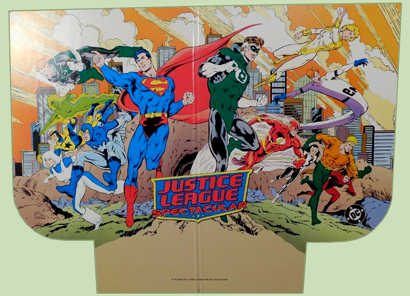 Check out this nifty promotional "header card" DC produced in 1992 for Justice League Spectacular, a double-sized one-shot which featured (from what I remember, clue me in if I'm wrong) some major changes made to the JL franchise. That included the addition of new/old members, like Aquaman, seen at bottom right! This kind of POP stuff tends not to survive, so seeing it for sale on ebay is a bit of a surprise. Big thanks to F.O.A.M.er Ilke Hincer for pointing it out! Could be the birth of the Justice League America / Europe duo? Right half of the image depicts the initial roster of JLE (lead by Hal Jordan), if I'm not wrong, while the left half is the more classic JLI from the Giffen era, except for Superman was in none of those teams at the time (and not back before Morrison's run). This was after Breakdowns, when Jurgens took over Justice League America, and Gerard Jones shifted JLE to JLI and had Hal Jordan take over. Superman did join and lead the JLA. This all lead into Doomsday coming! Great stuff, and I had tired of BWAHAHA by then (sorry Shag), so I was very excited for this. Really enjoyed the Justice League America of this time period. Sadly JLE was not nearly as good and the art was terrible.Hated how he drew Aquaman among other things.